Thorogood's band was good but, I dunno, it played the same set as it would have 20 years ago. George himself looked OK but a bit paunchier than he used to -- then again, who doesn't? A former Hitler Youth, 74-year-old Lennie Cuje first heard jazz on an American occupier's radio shortly after the Nazis fell. Lennie fell in love with this music, and less than five years later made his way to America -- specifically to Harlem to hear Lionel Hampton and his band. Strange, Lennie thought, that so many white Americans showed black Lionel the same contempt that Germans showed Jews. Christy and I had the good luck to hear Lennie play last month at Smalls, a jazz club in Greenwich Village. We sat right in front of the guy, who's still agile enough to keep up with fellow players a third his age -- in a set that started at 1 AM. Check out Lennie's MySpace page. Here's a Q&A and a wonderful video documentary on the life of Lennie Cuje, produced by the Washington Post. Dweezil Zappa, Frank's younger son, makes a living these days playing his Dad's music onstage with an eight-piece band. 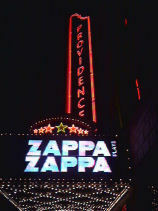 Last night in Providence, Dweezil put on an excellent and unusual show. He and his band played rhythm on three songs -- "Cosmik Debris," "Dumb All Over" and "Muffin Man" -- while Frank Zappa played lead guitar on a video screen hung above the stage. We could see Dweezil's genuine reverence as he looked up and played for his Dad. The theater was maybe 60 percent full last night; last year's Providence show was sold out. Perhaps that's why Dweezil said at least three times that "we'll see you next year." He hopes so. Frank Zappa's original fans are aging -- and few can successfully drag their kid to a concert, even to hear a song called "The Illinois Enema Bandit." Clear Channel radio stations aren't playing any songs from Bruce Springsteen's new "Magic" album even though it currently tops the charts. While it's great that Fox News is calling attention to this bit of censorship, it's not because Bruce is "old," as writer Roger Friedman asserts. For starters, the single "Radio Nowhere" craps on the radio business. Clear Channel didn't play Tom Petty's "The Last DJ" either, for the same reason. The issue unaddressed by Fox is Springsteen's willingness to stand up against what he sees as the fascism gripping this country. Remember also that Springsteen ardently raised money for John Kerry in 2004. Clear Channel simply is not going to help Springsteen make money -- period. Bruce is lucky Clear Channel doesn't send someone out to blow up his tour bus. On Monday, Oct. 15 a four-hour documentary film titled "Runnin' Down a Dream" debuts for one night only in theaters across the country. 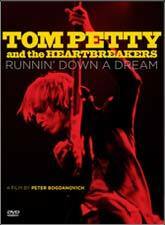 Directed by Peter Bogdanovich, most famous for directing the 1971 cult flick "The Last Picture Show", the film depicts the life of Tom Petty and his 30+ years with The Heartbreakers. And Lord knows what else: four hours is an awfully long time to sit still for anything, much less a documentary on a rock band even as good as this one. On Tuesday the DVD will go on sale exclusively at Best Buy. I've already asked Santa for it, but I'll probably break down (get it?) and buy one sooner. Bruce Springsteen is touring again, making music with the E Street Band for the first time since 2002. He played last night in his boyhood home town of Asbury Park, NJ before a crowd of 3,000. There's little I could say about Springsteen that (a) you don't already know if you're a fan and (b) could be of any interest to you if you're not. 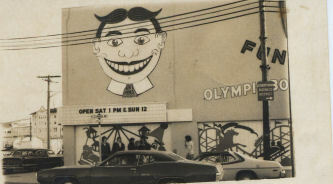 That said, the photo above is of the Asbury Park boardwalk in the Spring of 1976. Returning to Boston from a college radio convention in Philadelphia, the six of us took a little detour so we could pay homage to the guy who once spent his summers "hanging in them dusty arcades, banging them pleasure machines..."
Wall Street Journal reporter Don Clark and his band "Off the Record" regaled about 125 last night at a San Francisco fundraiser organized by Voce Communications (an SWMS subscriber). Proceeds went to Girls for a Change. 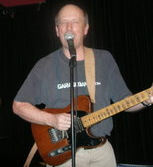 Don's repertoire drew from the '60s, '70s and '80s. Most of the 30-somethings grew up with 867-5309 but only geezers like me would know the words to Marvin Gaye's "Ain't That Peculiar." Spotted in the crowd: Tom Foremski of Silicon Valley Watcher, Gabe Rivera of Techmeme and Kevin Maney (a musician in his own right) of Conde Nast Portfolio.